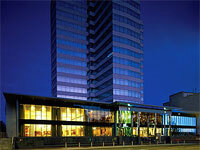 The Mecure Holland House Hotel is one of Cardiff's newest luxury hotels. Opened in the Spring of 2004 it has established itself as a favourite destination for both business and pleasure travellers. The Holland House hotel is located towards the East side of the city centre, along Newport Road. It is only a 5 minute walk from the main shopping centre (Queen Street) and a 15-20 minute walk to the Millennium Stadium. The hotel has 165 guest rooms, a fully equipped gym, large swimming pool, restaurant and bar. If you book a bedroom located on one of the upper floors you will enjoy some great views across the city. Award winning First Floor restaurant. Luxury leisure club and spa. 15 meeting rooms/function suites for conferences, events and weddings. Underground car parking at the hotel (subject to availability).